A Japanese automaker taking on The Big Three wouldn't be a big story in any market, except trucks. The completely redesigned Cummins-diesel powered 2016 Nissan Titan is posturing to really shake up the American truck market. Here's everything we know about it so far. 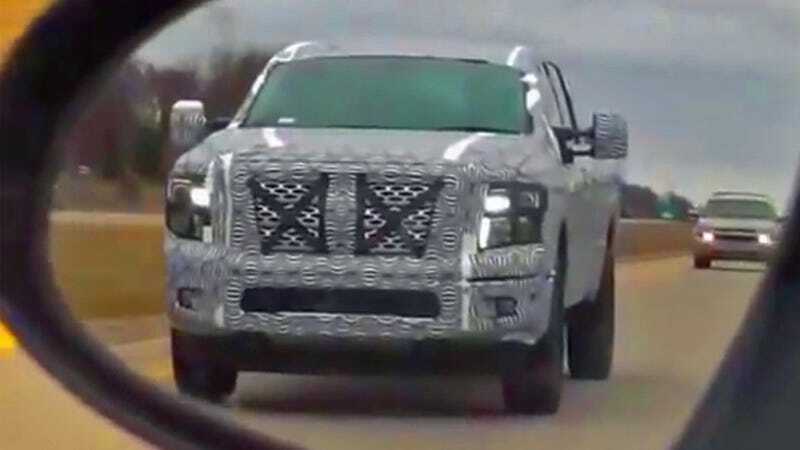 We know for sure that the long-overdue revision of the Nissan Titan will drop January 12, and will be offered with a Cummins turbo diesel 5.0 V8. We've been hearing this hyped up and seeing the goofy "#CumminsSoon" tag for months, but you can't deny the importance of Nissan taking on the big boys of the US truck market by partnering with a well-established brand that feels 'murican as it gets. We also also know the new Titan going to have serious towing capacity; you don't bother running a gooseneck hitch for hooking up some dinky Home Depot rental trailer. I've gotta believe a Cummins V8 will out-heave the current class-leading Ford EcoBoost V6, the question will be whether Nissan can engineer a frame strong enough to let its new engine beat the 2015 Ford F-150's obscene 12,200 pound towing capacity. "This new engine will offer the right balance of power, performance and fuel economy while delivering the dependability that customers expect. With a torque rating in the mid-500s (lb-ft) and more than 300 horsepower, the Cummins 5.0L V8 Turbo Diesel will provide light truck customers the combination of towing capacity and mileage that is expected in the highly-competitive North American truck marketplace." We haven't heard anything about other engine options or trim levels. I'm sure they're keeping a gasoline engine option, but I wonder if they'll drop the Endurance V8 in leu of a large V6 for the base trucks to make an inexpensive option. Diesel engines are big money... usually like an $8,000 option on the heavy-duty Ford, Chevy, and Ram trucks you can order one in. On top of the new Titan's base and mid-level trims we can probably expect some kind of range-topping SV Platinum variant, since all the other truck guys have a $60,000 "luxotruck" half-ton option. It will be interesting to see if they keep the "off-road/premium" PRO-4X trim with uprated shocks and nice seats or move to a luxury-focused range topper.